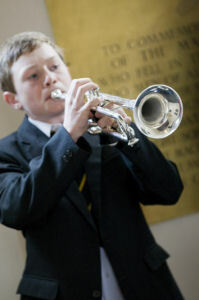 On Tuesday 5 May 2009 a party from Tonbridge School visited Ypres to dedicate a plaque in St George’s Memorial Chapel. 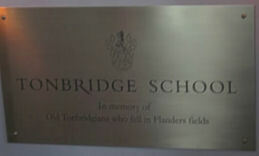 The plaque commemorates Old Tonbridgians (OTs) who fought and died in the First World War, and in particular those who fell in the Ypres Salient. I was interested to join this party both as an Old Tonbridgian (Parkside House 1955-60) and, significantly for me, because my great aunt Edie had served as a nurse very close to Ypres, at No 3 Casualty Clearing Station which was based at Hazebrouck from August 1914, moved to Poperinghe in April 1915 and, a month later under fire, moved to Bailleul. She was posted from the CCS at Bailleul to General Hospital No. 1 at Etretat in November 1915 but, during her period just behind the front lines, Edie writes daily in her diary not only about her experience of dealing with hundreds of wounded men from the trenches but also about her other experiences. See volumes 1 and 2 of Edie's diaries. The trip was by coach and Eurotunnel direct to Ypres with a running commentary from Ian Taylor, roughly a contemporary of mine at Tonbridge, who now acts as a Battlefield Tour Guide specializing in the Second World War but with a great deal of information about the Great War. His comments were interspersed with showings on a TV screen in the coach of some films (mostly made in the 1990s) recording the memories of the few remaining Tommies who had themselves been in the trenches and were then mostly in their 90s and some over 100. At the time of writing (May 2009) there now remains alive only the redoubtable Harry Patch who is 110 years old (more information at: http://en.wikipedia.org/wiki/Harry_Patch). 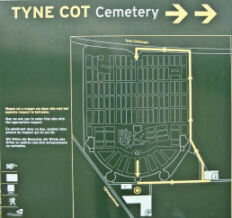 Our route took us on a loop south then east of Ypres to Tyne Cot cemetery where a short wreath laying dedication took place. 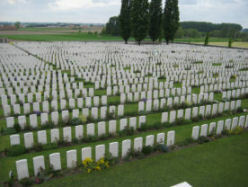 Tyne Cot is at the highest point of the Ypres Salient and contains 11,500 graves; it is the largest Commonwealth cemetery in the world and the most important reminder of the bloody battle of Passchendaele. 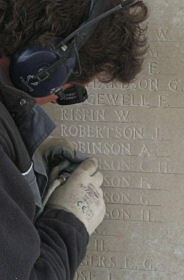 There is a memorial – a long wall – commemorating all those who fell in the Salient from August 1917 and have no known grave; there are 35,000 names on it including eight OTs. 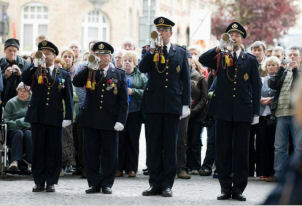 63 OTs are either buried or commemorated in and around Ypres. In the summer term of 1914 there were 436 boys in the school. 2,300 OTs served in the war and 415 of these were killed; at least double this number were wounded, some of them more than once. "Ypres is dead - a silent town of broken and burnt houses and destroyed streets - unburied bodies lie all about the place a scene of utter desolation. A few of our Military police are stationed there and an occasional shell comes over - otherwise all is finished." 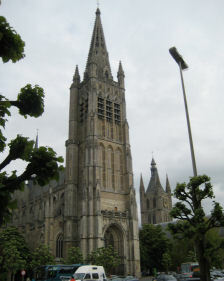 But in July and August 1915 (in Volume 2 of her diaries) Edie records sitting on hills overlooking Ypres. Here's an example from 31 July: "Had the 1/2 day off duty, having evacuated 2 of my 6 cases. I called for Miss Congleton & took tea on to Mt Noir. 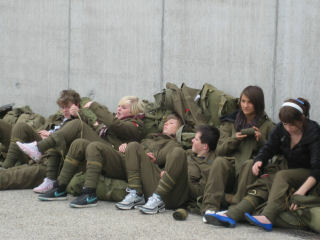 Sat in a lonely spot overlooking Ypres -- & had it." 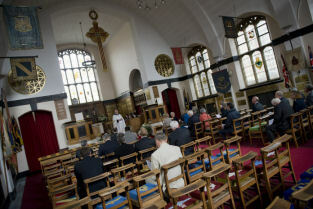 A brief service of dedication took place in St Georges's Memorial Chapel with a small choir from the school – they sang beautifully – and a young trumpeter who played the Last Post and Reveille – best of the three times we heard it on the day - and the names of 63 OTs who died at Ypres were read out. 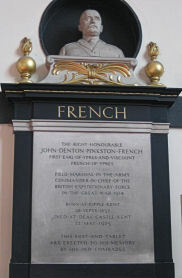 Two memorials I noted in the Church were those of Field Marshall Sir John French, First Earl of Ypres (left) and Field Marshall Viscount Plumer (right), both of whom Edie mentions as having seen: French on 8 August and Plumer on 12 August 1915 (see Volume 2). 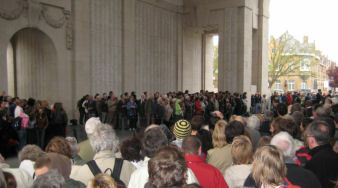 After supper in the Vivaldi restaurant we made our way to the Menin Gate for the Last Post Ceremony. Several hundred people of all ages had assembled under the huge arch which was erected and unveiled in July 1927. It stands on the site of an old gateway on the road to Menin which leads into the town and along which tens of thousands of British soldiers marched on their way to the trenches. "From 11 November, 1929 the Last Post has been sounded at the Menin Gate memorial every night and in all weathers. The only exception to this was during the four years of the German occupation of Ypres from 20 May 1940 to 6 September 1944. 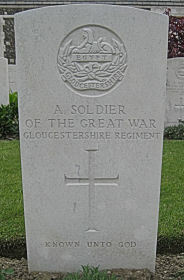 The daily ceremony was instead continued in England at Brookwood Military Cemetery, Surrey. 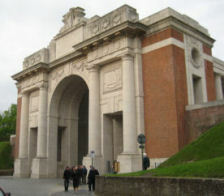 On the very evening that Polish forces liberated Ypres the ceremony was resumed at the Menin Gate, in spite of the heavy fighting still going on in other parts of the town." Right: Sign on a minibus. A most moving day, both to commemorate all those young men who died and as my first visit to see the area Edie had described so remarkably in her diaries. With grateful acknowledgement to David Walsh for information about OTs who we were commemorating and to the OT Society for organising this trip.